We generally don't have time to review lower-end products, but sometimes we see something at such an aggressive price we just have to take it for a spin. That pretty much describes our feelings about the ASUS Transformer Book T100, a 10-inch Windows tablet that comes with a keyboard dock in the box -- all for just $349. Incidentally, too, this is the first product we're testing with Intel's new quad-core Bay Trail-series Atom processor, which can run full Windows while at the same time keep pace with low-power chips like the ones in the Surface 2 and Nokia Lumia 2520. So, is all of that enough to make it a good deal? 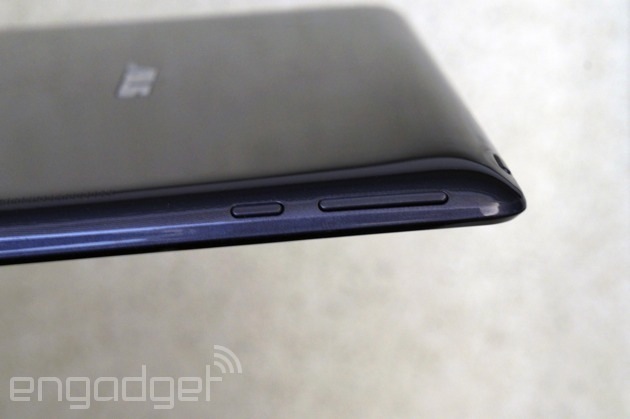 And can you forgive ASUS for all the ways it cut corners? We think you might. With cheap build quality and a mediocre display, the T100 is far from perfect. But thanks to some solid performance and generous pricing, it still offers incredible bang for your buck. How would you rate the Transformer Book T100? It's easy to forget ASUS was once king of the netbook space. Nowadays, the company mainly makes headlines for its futuristic-looking Ultrabooks and its beastly gaming machines. 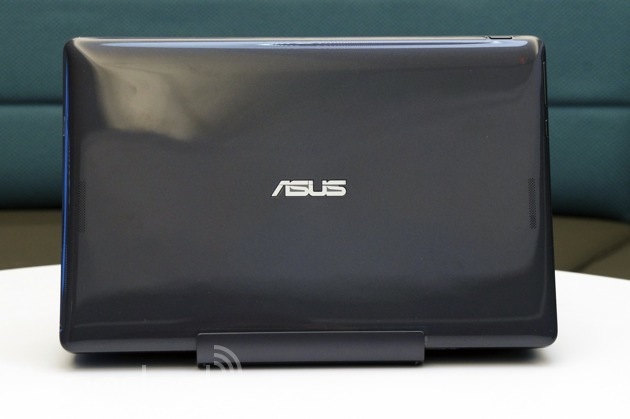 But the T100 is a reminder that ASUS is actually very good at making super-small, super-cheap PCs. Though the T100 shares the same form factor as ASUS' line of Transformer Pad Android tablets, the quality is much lower. Look closely and you'll see it has the same pattern of concentric circles on the back, but instead of being made of metal, the back is all plastic. Shiny, fingerprint-prone plastic, at that. Not even that efficient polycarbonate stuff we've been seeing lately on other devices. 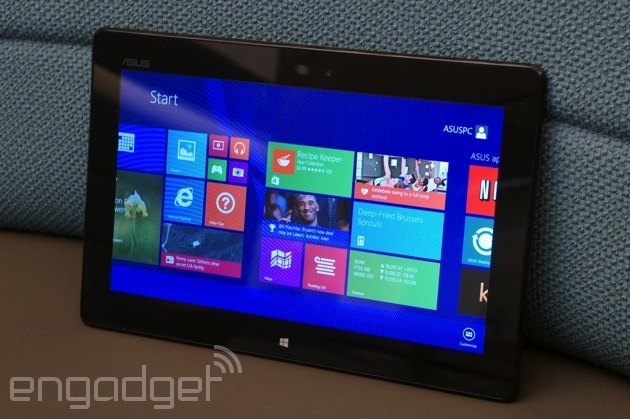 It's a definite step down in quality, but then again, ASUS tends to sell its flagship Android tablets for around $500. Clearly, the priority here was to push the price down and keep the keyboard dock in the box. Speaking of the sort, the keyboard is where ASUS' netbook roots really start to show. The layout actually isn't that different from the company's 2008-era minis (making a comfortable keyboard for a 10-inch device evidently presents the same spatial limitations as ever). A full-sized keyboard this is not, but all things considered, it's reasonably easy to type on, especially since certain important buttons like Enter, Shift and Backspace are generously sized. Still, the underlying panel feels a bit unsteady, and the keys are quite noisy. All in all, we would never suggest you use this as your primary keyboard, but for taking notes, searching the web and dashing off quick emails, it's fine. That said, you might still want to consider pairing it with a mobile mouse: The small built-in touchpad can be too jumpy even for single-finger navigation. Try and hit an onscreen object too close to the left edge of the screen for instance, and you might accidentally cycle through open apps instead. What's especially nice is that when the tablet is docked inside the keyboard, it stays put in the lap; unlike with some other keyboard docks we've tested recently, you don't have to worry about this guy toppling backward. Bonus: Since there's no kickstand at work here, the screen angle is adjustable. As it happens, the 1,366 x 768 IPS screen offers pretty wide viewing angles anyway, with a 300-nit brightness rating allowing for easy readability under harsh fluorescent lights (outdoor viewing is another story). 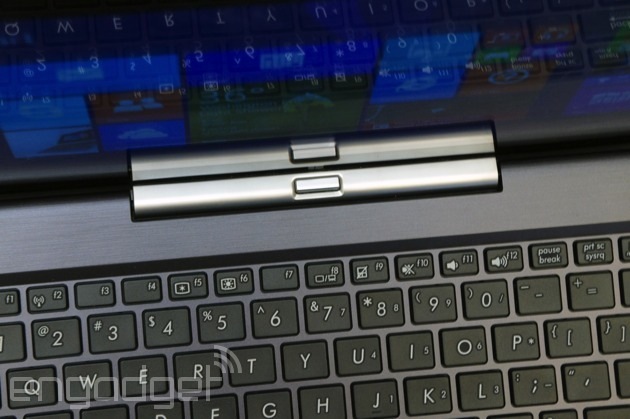 So, the T100 looks like a netbook, and offers the same typing experience as a netbook. And it feels like one too: With the tablet docked so that it's in clamshell mode, the whole thing weighs 2.4 pounds (the tablet itself comes in at 1.2 pounds). It's just about as heavy as a netbook, and just as easy to carry in one hand, though it will still feel heavy compared to a Surface 2 with a Touch Cover attached. One convenient thing about having the keyboard dock in the box (aside from all that typing) is the selection of ports you'll get -- namely, a USB 3.0 socket on the left side of the dock. On the tablet itself, you'll find micro-USB and micro-HDMI ports on the right landscape edge, along with a headphone jack and microSD slot. Over on the left, meanwhile, is the volume rocker and Windows Home key. Up top is the power button, just where you'd expect it to be. And on the bottom? The very necessary docking connectors (also where you'd expect them to be). Around back, you'll find speakers on either side, which push out surprisingly loud sound. You won't want to crank the volume all the way up, though, as the quality becomes unusually distorted; you can actually hear some buzzing in addition to the actual music, and that's despite having ASUS' SonicMaster technology on board. Settle on a more medium volume setting for a more pleasant experience. Rounding out our tour, there's one thing you won't see: a rear camera. That's right, there's just a 1.2-megapixel webcam here for the occasional video chat. A bit of a surprise, given that ASUS normally puts out decent tablet cameras, but then again, it had to cut costs somehow. Well, this is a nice surprise: The T100 comes with very little third-party software installed. On tap, we have Netflix (an app we actually like), along with Microsoft's newly updated OneNote app, and Microsoft Office. Users also get unlimited ASUS WebStorage, but alas, it's only free for one year, so be prepared to pay up (or switch providers) after that. As for warranty coverage, the T100 comes with one year of support, just like most products we review around here. The T100 is the first device we're testing with one of Intel's new Bay Trail-series Atom chips -- specifically, a quad-core Z3740 processor, clocked at 1.33GHz. With the help of 2GB of RAM, the tablet handles the overhead of Windows 8.1 just fine. Performance almost always felt smooth, whether we were cycling through open programs, returning to the Start screen or flipping pages in the Kindle app. As for apps, you might be wondering how far you can go in the world of traditional desktop programs before the tablet starts to stutter. As you can imagine, we didn't bother to install full Photoshop on this -- that's not what this device was made for -- but we did try lightweight apps like iTunes, Spotify and HipChat (the Engadget staff's IM client of choice). All of these ran smoothly with no hiccups. As for battery life, the 31Wh cell is rated for up to 11 hours of casual usage, up to 9.5 hours of video playback and up to 10 days of standby time. We'd say these claims are on the conservative side: With the brightness set to 50 percent and WiFi on, we actually got 10 hours and 40 minutes of video playback, so that bodes even better for more intermittent usage. All told, that's still a good three hours behind new ARM-powered tablets like the iPad Air, Surface 2 and Nokia Lumia 2520, but it matches what we were getting from tablets that came out last year, including the iPad 4. There are two configurations of the T100, with the only difference being internal storage: There's a 32GB model that goes for $349, and a 64GB version priced at $399. Either way, the rest of the specs are the same, and they both come with the keyboard dock in the box. What's funny is that there aren't that many other tablets this size using Intel's new Bay Trail processor. There's the 10.8-inch Dell Venue 11 Pro, which starts at $500 with 64GB of storage, 2GB of RAM, a high-res 1080p display and a similar Bay Trail processor. Unfortunately, though, a keyboard isn't included in the box, so the price gap versus the 64GB T100 is actually even greater than the $100 base price. There's also the HP Pavilion x2, which just recently went on sale for $600 (dock included). At this point, it also makes sense to mention Microsoft's Surface 2, though even that isn't quite the same. Namely, it packs a Tegra 4 processor and Windows RT, which means it can't run traditional x86 applications; only apps downloaded from the Windows Store. 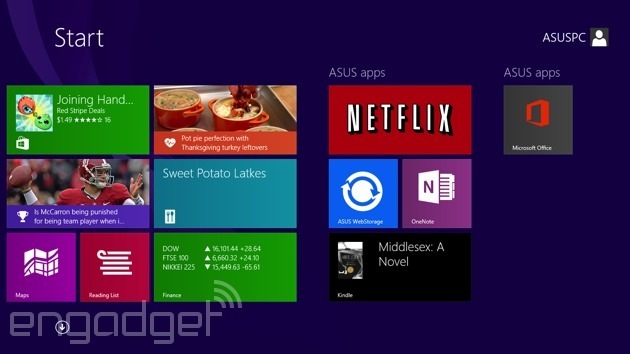 It's the same story for the new Nokia Lumia 2520, the only other Windows RT tablet currently available. Though it offers comparable performance and battery life to the Surface 2, it's lighter and easier to use in tablet mode, and it also comes standard with an LTE radio (Verizon and AT&T will sell it in the US). However, the 2520's optional keyboard dock isn't as comfortable as the Surface 2's keyboard covers, and it doesn't sit as well in the lap either. Either way, they're both more comfortable to type on than the T100, and they're both just generally better-made. Again, though, you have to be OK with the fact that although the Windows Store is growing rapidly, it still has some holes. But back to the T100: What else can you get for the same price? Well, you can buy a smaller 8-inch tablet like the Acer Iconia W4 ($330), Lenovo Miix 2 ($299), Toshiba Encore ($330) or Dell Venue 8 Pro ($300), but these offer less screen real estate, of course, and weren't necessarily designed to be used with keyboard cases. Meanwhile, netbooks have also made a comeback in the form of super-cheap, touchscreen laptops -- almost all of which have 11-inch screens, similar to the ASUS T100 we're reviewing today. These include the HP Pavilion 10 TouchSmart ($350), the Dell Inspiron 11 ($380) and the Toshiba NB15t ($380). Keep in mind, though, that these machines will be heavier and will likely offer shorter battery life. And though we haven't spent enough time with the Dell or Toshiba models to pass judgment, we've played with HP's offering, and found the touchscreen to be far less responsive than what you'd get on a proper tablet. We wouldn't necessarily like the T100 if it weren't for its extraordinarily low price: It looks and feels like a netbook, with a tacky plastic shell, middling display and cramped keyboard. Still, it offers solid performance for the money, allowing you to run full Windows programs when some pricier tablets will only run apps from the Windows Store. The battery life is also impressively long, albeit not quite as long as an ARM-powered Windows RT device. And as much as we might kvetch about the keyboard, it's at least included in the box, instead of sold as a $120 add-on. You'll be making some compromises if buy this, but for $349, we doubt you'll have many regrets.